Neutrino oscillations provide the most compelling evidence for physics beyond the Standard Model. Over the last two decades several experiments have been performed to study this phenomenon. Among those, T2K played a fundamental role in the understanding of the mixing mechanism. It was indeed the first experiment to prove flavor appearance, having firmly established in summer 2013 electron neutrino appearance in a muon neutrino beam. The T2K experiment operates in Japan since 2010. 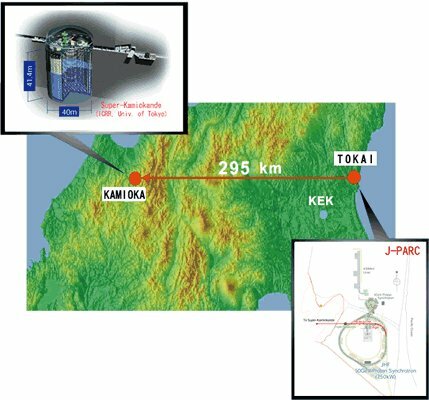 An intense muon neutrino beam produced in J-Parc (Japan Proton Accelerator Research Complex) in Tokai, is observed first by a Near Detector at 280 m distance and then 295 km away by the Super-Kamiokande detector in the Kamioka Observatory. The neutrino energy is peaked around 0.6 GeV, in order to maximize the oscillation probability at that distance. With only about the 10% of the approved statistic accumulated T2K was able to unambiguously prove the electron neutrino appearance and to perform the world leading measurement of oscillation parameters ruling the muon neutrino disappearance. T2K measurements combined with those from reactor experiments provide also first hints on the δCP violating phase, excluding the zero value at 1 σ. The observation of a CP asymmetry in the leptonic sector would be very valuable as it could contribute to the explanation of the matter dominance over antimatter observed in the Universe. For this reason, since May 2014 T2K is collecting data also with reversed current in the magnetic focusing horn, in order to produce a beam composed primarily by muon antineutrinos. First results of antineutrino disappearance and appearance were released in 2015. The T2K Bern group is mostly involved in neutrino cross section measurements at the near detector ND280. The role of ND280 is to measure the characteristics of the unoscillated neutrino beam, in order to constrain flux and cross section parameters of the T2K neutrino oscillation analysis and reduce systematic uncertainties. The ND280 results are also useful to test the cross section models used by T2K and other neutrino experiments.